Has anyone done a price comparison on available seats for the RT? Corbin, RDL, Kontour, Ultimate, Mustang, BRP Comfort, etc.? I've got almost $1500 in my Corbin with trunkrest, armrests, and rider backrest, but it is well worth the cost to me. I blew out a coupla discs in my lower back last summer because the stock seat is too soft for me - when I was leaning to the right my torso was going to the left and vice versa All is well now! I would be interested in this also. Maybe add Russell Day Long on the list. My cost for shipping going out is not included in these numbers. Also not included is the passenger back rest. Best comfort mod I have done. Last edited by spyder3; 07-15-2012 at 10:19 AM. Rider only or both rider and passenger? The entire seat, since its all one piece. does not include the passenger backrest..
RDL = Russell Day Long. Corbin with trunkrest and heated both seats..... $1,100.00 including shipping. The trunkrest was like $275. Heated seat option $200. Should have it this week-- can't wait!! Spyder #1 - 2008 GS SM5 Premier Edition #1977. RIP after 80,000 miles. Spyder #2 - 2012 RT SM5. Traded in after 24,000 miles. Spyder #3 - 2015 F3 SM6. Put 13,000 miles on and sold it. Spyder #4 - 2017 F3 SM6. Too good of a deal to pass up! Your signature is showing "Zero mods at this time" Isn't it time for a re-write?? Most of the custom seats mentioned are in the $1000.00 price range. The BRP custom seat is about $500.00. Someone besides Corbin is doing the gas door? Nothing like copying someones idea. They did better than corbin, they put a locking gas door. I paid $1350 for a Kontour seat and $239 for a Utopia driver backrest. I also paid another $100 to ship the original spyder seat and passenger backrest to Kontour. 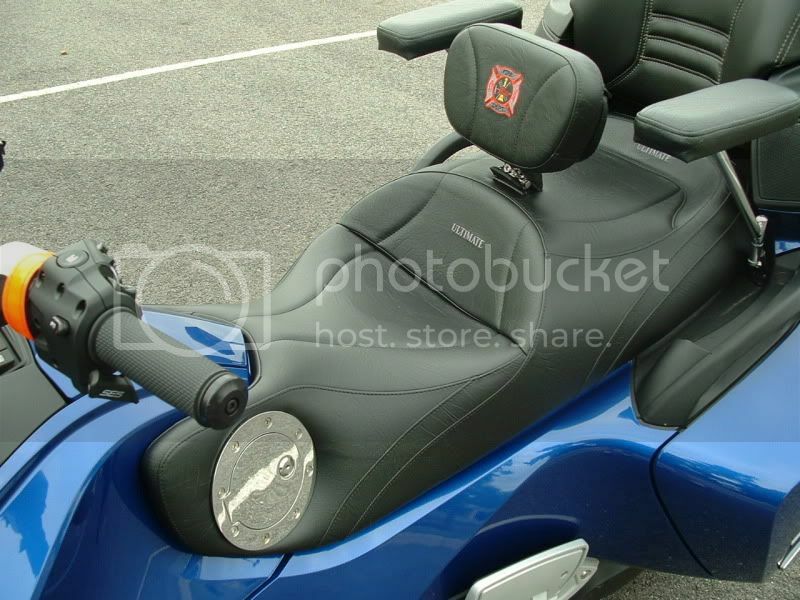 The Kontour price included rebuilding the spyder seat, installing the Utopia driver backrest, and recovering the passenger and Utopia backrests with the same materials used on the main seat so that they would match. I paid $1350 for a Kontour seat. So far I'm pleased with it. I don't have a lot of time in the saddle yet, but I'm not setting in my own sweat while riding in the Texas heat like I was with the stock vinyl seat. The breathability was the main reason that I went with Kontour over the others. I'm sure the seat's mesh covering along with adding the Baker Air Wings for directed air flow has helped with keeping things cooler. I also don't have to worry about hopping on a hot 170+ degree seat after it has been setting all day at work in the parking lot because the seat reflects 70 percent of the radiant heat. The seat is much cooler than it was before. The seat's waterproof barrier is also a plus because I don't need to protect the seat when I'm caught in the rain. The only downside to the seat other than being pricey is that it isn't as "pretty" to look at when compared to a Corbin or Ultimate seat. I like both of those seats, but function was more important to me than looks. The Kontour looks good, but it is different because it is covered in a mesh material instead of leather or vinyl. Well.. 'better' is a very subjective term. I much prefer the hidden door on the Corbin compared to the locking huge gas door pictured above. Never been worried about someone stealing gas.... besides having to deal with a key to open it every time? No thanks. Sorry to be the bearer of bad news, however you may want to sit down (literally) before I tell you what we now charge for the Spyder RT seat: $1500.00. It's the most difficult seat we've EVER had to deal with - by far - and takes two full days to build. Most of the extra time is due to labor involved. There's a HUGE difference between it and the RS seat, which we will build for $875.00 with both sections rebuilt to full KonTour Specification, or just the driver for $775.00. I rode my RS about 12K last year with the BRP Comfort Seat and was very comfortable on it. My RT seat did not agree with my posterior. While at Spyderfest I sat on a bunch of different seats, some with backrests, etc., and my back side wasn't particularly impressed with any of them, especially when the cost came into view. I kept looking and think I found a low cost solution that has worked for me. Please note, I don't want a backrest, heat, embroidery, gas door or the like. And I didn't want to spend a bunch of cash to eliminate those dang hot spots I would get. Found a small company in the little town of Jonesboro, Indiana, called Astech Seats. Rode over and had their mod done a few weeks ago. After 700 miles, I'm really like what they did. It works for me and at a fraction of the big name brands. May or may not work for others. And I'd be afraid of burning the crap out of my leg on that metal cap. Ouch! I'm not a fan of the fuel door, but I like the look of the seat. If I was going to do a fuel door, I'd prefer Corbin's implementation. The fuel door on the Ultimate looks like the fuel door on my Jeep. JMHO.